Melynda Harrison worked in partnership with Visit Idaho to create this Travel Tip. The Camas National Wildlife Refuge is one of those places you see signs for along I-15 in eastern Idaho and always wonder what it’s about, at least I did. Every time I’ve driven that route, I remind myself to make time to stop and explore the next time I drive through. “Next time” finally arrived when my family and I stayed in Idaho Falls. On our way north we pulled off the highway, followed the circuitous route to the Camas National Wildlife Refuge and were delighted by the huge numbers of birds backed by gorgeous mountains. Make plans to explore the Camas Wildlife Refuge. Photo Credit: Melynda Harrison. Our first stop was at the information board at the Refuge Headquarters. As soon as we opened the car doors, our heads were full of the sounds of birds and children. A school group from Idaho Falls gathered under a pavilion to ready themselves for a birding field trip. We grabbed a map and drove down the narrow, dirt road to Big Pond. The refuge sits at about 4,800 feet and is made up of ponds, wetlands, sagebrush steppe, and agricultural units. 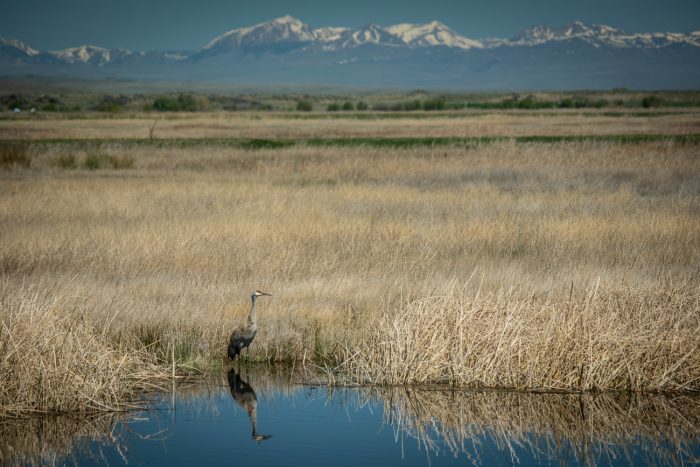 Its primary purpose is the conservation of waterfowl and waterbirds and their habitat, but it also supports sagebrush-steppe fauna, including moose, and water for agriculture. Check out the interpretative signs to learn more. Photo Credit: Melynda Harrison. We stopped at the first pullout and read an interpretive sign about wetland management. My older son, Anders, and I climbed up a small metal pier to scan the pond for birds we could identify. Neither of us is an avid birder, but it was fun to see and hear red-winged blackbirds, yellow-headed blackbirds, mallard ducks, Canada geese, and trumpeter swans. Anders and I pointed to each and tried to identify them before the other could. My husband, Henry, can identify birds much better than Anders, our other son, Finn, or I. He pointed out ruddy ducks, cinnamon teals, American shovelers, and sandpipers. Although we didn’t see them at first, we all heard the distinctive rattling call of the Sandhill crane. Keep your eyes open for wildlife. Photo Credit: Melynda Harrison. The water levels vary with the seasons and with agricultural practices in the area. Each season brings different birds to the refuge. It’s an important resting spot and feeding ground for migrating birds which stop here on their way north in spring and south in fall. That means you can visit the wildlife refuge at various times throughout the year and have a totally different experience. In early spring, 15,000- 20,000 snow geese alight at the refuge on their way to the Arctic. Summer brings chicks, goslings, and cygnets—baby birds just hatched from their eggs. Fall means peak waterfowl numbers –many of the same species that came through in spring. Canada geese, snow geese, trumpeter swans, and others fill the refuge. In winter, visitors can ski and snowshoe along Refuge roads to see bald eagles, ring-necked pheasants, and other hearty birds. We continued driving around Big Pond, stopping at pullouts along the way. 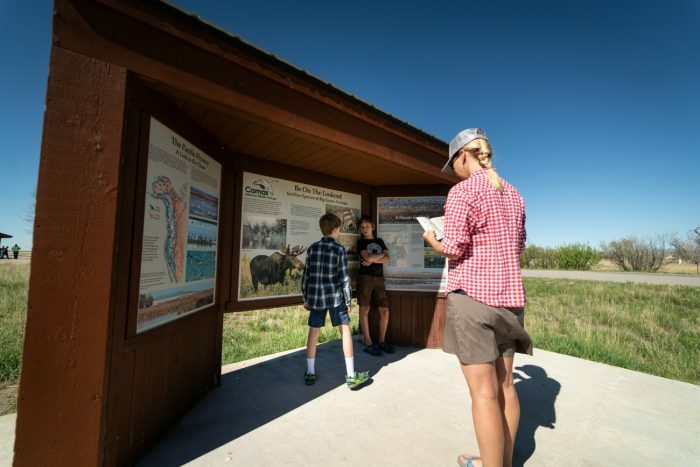 In places where there were interpretive signs, we read up on refuge management, birds, and conservation. Everywhere, we watched the ponds with binoculars and listened to the cacophony of ducks, geese, songbirds, cranes, and other birds. To the north and east, mountains rose into the sky and provided a spectacular background. We could even make out the Tetons to the southwest. There’s plenty to see. Photo Credit: Melynda Harrison. 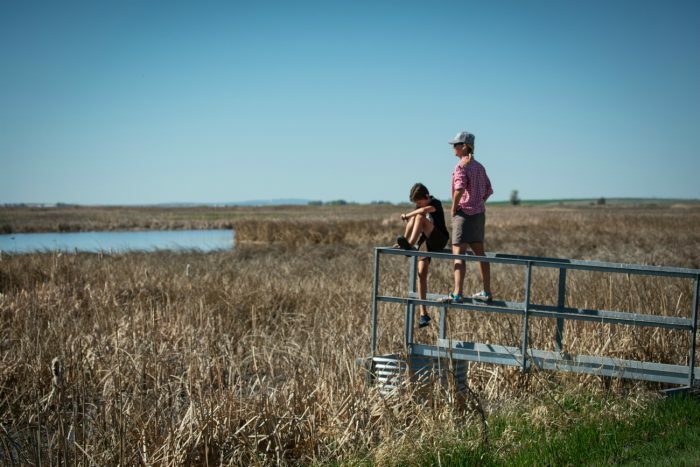 The water that fills the ponds and floats the ducks at Camas Wildlife Refuge comes from melting snow in the mountains. The Continental Divide lies 45 miles to the north, its runoff flowing into the Refuge via Camas Creek and its tributaries. There is no outlet stream in the refuge – water either sinks into the ground and the water table or evaporates into the air. Spot all sorts of wildlife from the viewing areas. Photo Credit: Melynda Harrison. Henry could have looked at birds all day and we (mostly) stopped the identification and walked along the road and trails. No one else was at the refuge the day we went, save for the school group back at the headquarters. We talked about other places where we had seen some of the same species of birds squawking, quacking, chirping, trilling, and cawing around us. We relived other wildlife encounters we experienced together. One day, we will be somewhere else, looking at another bird and recall the day we finally stopped at Camas Wildlife Refuge. 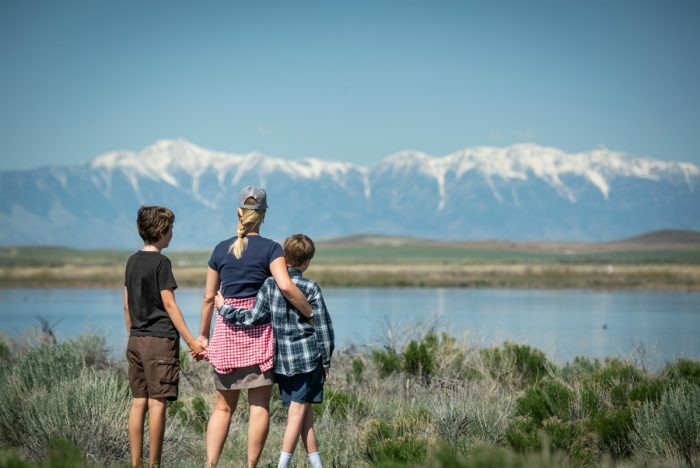 Melynda Harrison writes about travel and outdoor family adventure at TravelingMel.com, YellowstoneTrips.com, and for many local and regional publications. When she’s not behind a laptop, you can find her cross-country skiing, hiking, or floating a river.